Welcome to day #1 of Winnie & Walter 1st birthday new release. On day one we are premiering The Big, the Bold and Party stamp set, The Big, the Bold and Party cutaways and The Big, the Bold and You cutaways. 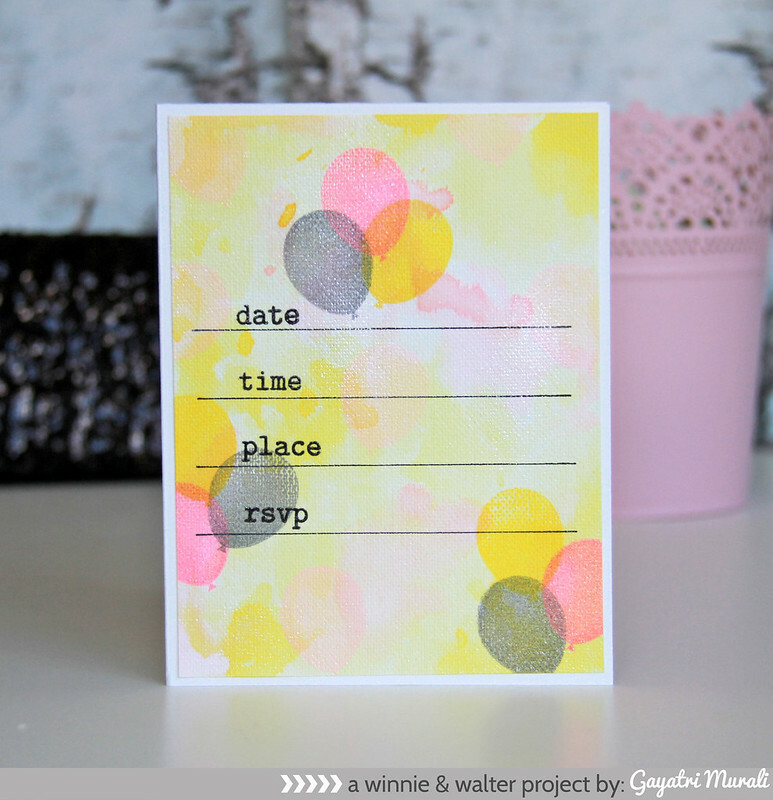 I have used the The Big, the Bold and Party stamp set to make an invitation card. I have used fabric paper as my panel base, on which I have colourwashed some Worn Lipstick, Spun Sugar, Squeezed Lemonade and Mustard Seed distress inks. Once dry I stamp the balloon from another new release stamp set using similar colour pigment inks plus neutral gray colour as well. I have then heat embossed the words fron The Big, the Bold and Party stamp set. This panel is then adhered to the card base. I pretty much did the same process for the inside panel too. This invitation is nice and flat and easy to mail out too. If you like The Big and Bold series and love this new stamp set, comment on the Winnie & Walter Blog to enter a chance to win not only this set but the cutaways as well. How awesome is that? 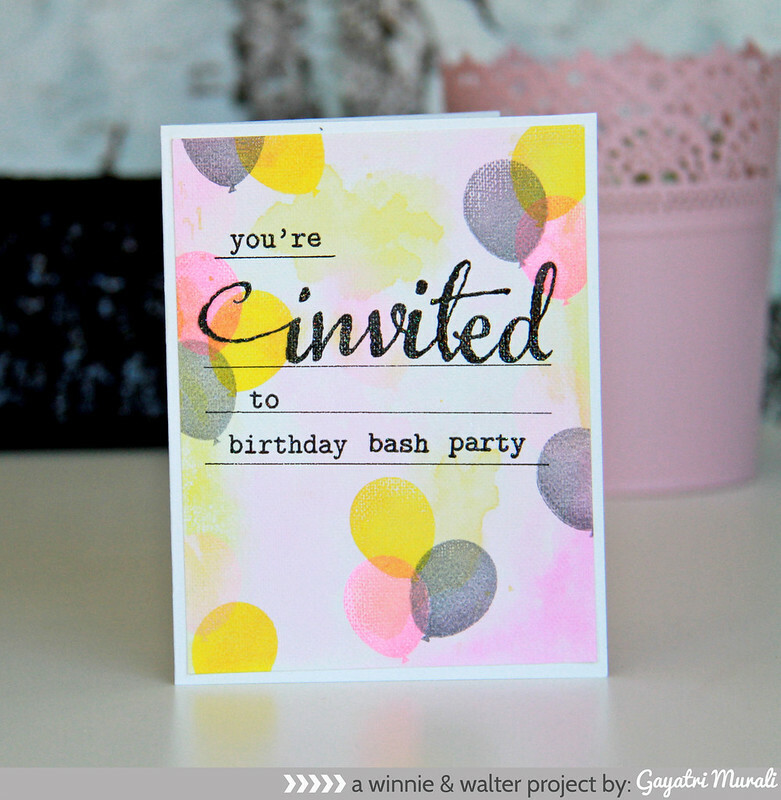 Winnie & Walter Blog also has more fabulous inspirations from Julie, Shay and rest of the design teams using these new release stamps and dies. Love this fabric paper, awesome creation with beautiful color wash! This is awesome!! Great colors! Beautiful invite!